I hammered down the trail, passing rocks and trees like they were standing still. Active didn't say what it meant and didn't mean what it said, but yeah - it's probably a good discount, although #3 states "Once enough people buy, the deal is on" (oops, it's sold out now). And BTW, doesn't a 50% savings equaling $40 mean the original price is $80? very cool, you deserve it. Active.com is all over your banner ads. can you eliminate them???? Nah, let them pay eric. YES. Easy to eliminate. Send Eric $10. Yep . . Just think it odd to have them advertise here. Happy to click, too. 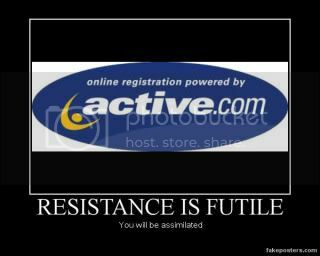 Have a special dislike for Active.